One last shot from my outing to Mdina with Michaela and Max. 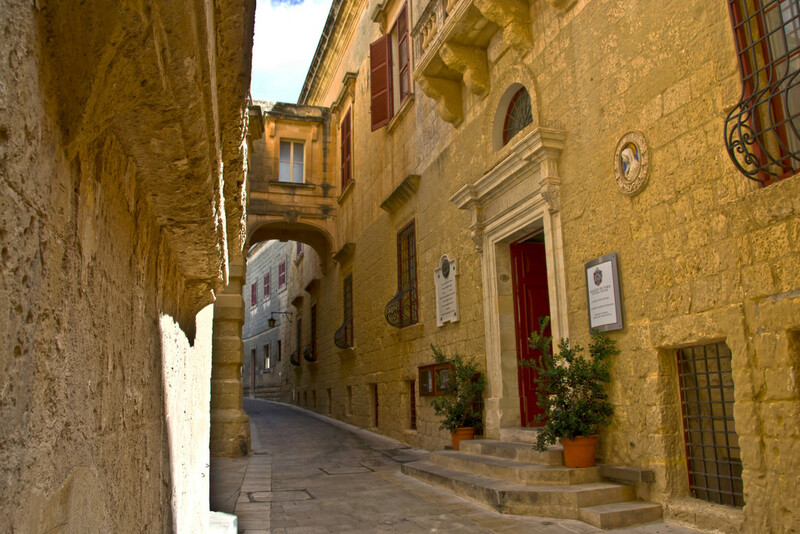 This is another of the beautiful Mdina streets. The building on the right is Palazzo de Piro. Up to some years ago it served as St Dorothy’s High School for girls and was connected to St Dorothy’s Nunnery on the other side of the street. Today the school has moved elsewhere and the place has been converted into a Cultural Centre. Yesterday we had the most spectacular sunset and I managed to take some shots. Will show tomorrow, God willing. Thank you very much for viewing and for your comments and fav’s on yesterday’s picture. Gorgeous street and lovely architecture!! How could I miss this?! My mother's name was Dorothy, so this is a very special name for me. St Dorothy is regarded as the patroness of gardeners. On her feast (February 6) trees are blessed in some places. She is also patroness of brewers, brides, florists, gardeners, midwives, newlyweds and Pescia, Italy. https://en.wikipedia.org/wiki/Dorothea_of_Caesarea And this a super photo of a beautiful place.Fav. Dione, this is part of the occasional posting of a slimmed down 365 project per my revised Profile notes. I very much appreciated your very kind comments on my most recent posting. Best wishes. Oh how I'd love to see such a lovely sight in person. Because it's highly unlikely I ever will, thank you so much for sharing the scene with us through this wonderful picture. Thank you too for your follow-up info on the crown on the sculpture. Such an interesting looking street and architecture! Great shot of this beautiful alley. The bars on the windows gives me alway`s mixed feelings. Are they for not come in or not breack out. ? I do n`t like to live in a prison. To day you can do so much, not to be seen, preventions. gorgeous street capture of this quaint part of town and its interesting history. Gorgeous street and lovely stonework FAV! Beautiful! I love the sculpture of the woman on the wall. So beautiful, Dione! Makes me want to visit! Beautiful street- seems so quiet and peaceful but when it was a girl's school I'm sure it was a bit noisier!